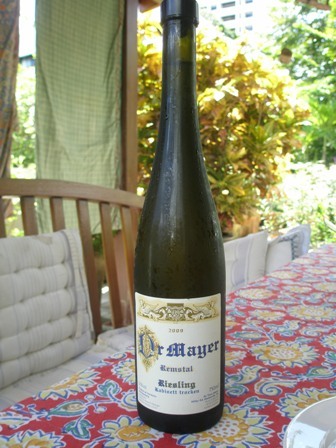 We were lucky that Timo Mayer, vintner and wine-maker of the Mayer Vineyard in the Yarra Valley, Victoria, carried with him a bottle of the ‘2009 Dr. Mayer Riesling’ with him when he dropped by recently here in Bangkok. 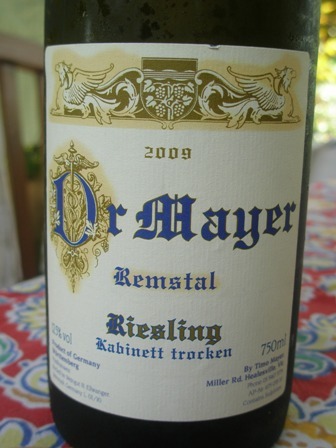 Timo came back from a wine making and wine selling visit to Germany where he had also made his ‘2009 Dr. Mayer Riesling’ from fruit sourced from his native Remstal (to be precise from a village called Grossheppach) in Wuerttemberg. The wine is under a glass enclosure which gives it a very elegant appearance. It’s a beautiful dry Riesling, elegant and fruity with a good structure and a long and intensive finish, in short a treasure of a wine. 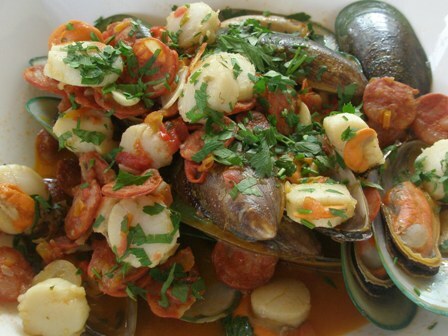 We saved the bottle for a special occasion, and surprise, surprise, the occasion should arrive very, very soon: a beautiful tropical Saturday afternoon lent itself for a delicious meal consisting of mussels, clams with chorizo sausages. This is a yummy dish and ideal light lunch. The bad news is, one cannot buy this wine in Germany, the motherland of Riesling wines. 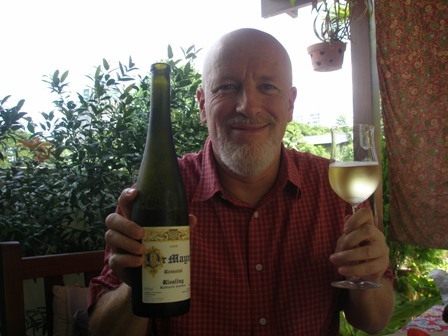 The good news is one can buy it from Timo Mayer in the Yarra Valley and the outlets carrying his wines in Victoria. Timo got only about a pallet, so you have to be quick. Better rush. This entry was posted on Wednesday, December 1st, 2010 at 10:22 pm and is filed under vineyards, wine. You can follow any responses to this entry through the RSS 2.0 feed. You can leave a response, or trackback from your own site.